Article 3: The public security organs are responsible for the investigation, detention, performing arrests, and pretrial of criminal cases. The people's procuratorates are responsible for reviewing, approving arrest, investigating cases directly accepted by the procuratorates, and initiating public prosecutions. The people's courts are responsible for trial. Unless the law specially provides, other organs, groups or individuals have no right to perform these powers. People's courts, people's procuratorates, and public security organs carrying our criminal prosecutions must strictly follow the provisions of this and other laws. Article 4: State security organs handle criminal cases of endangering national security in accordance with legal provisions, exercising the same functions and powers as public security organs. Article 5: People's courts follow legal provisions to independently exercise the power of adjudication; people's procuratorates follow legal provisions to independently exercise prosecution powers, and will not rbe interfered with by administrative organs, social groups or individuals. Article 6: People's courts, people's procuratorates and public security organs carrying out criminal prosecutions must rely on the people, must have the truth as their basis, and the law as their measure. The law is applied equally to all persons, and no one is permitted special privileges before the law. Article 7: People's court, people's procuratorates and public security organs carrying out criminal prosecutions shall divide labor and responsibilities, cooperate with each other and restrain each other, so as to ensure the proper and effective enforcement of the law. Article 8: The people's procuratorates peform legal supervision of criminal prosecutions in accordance with law. Article 9: Citizens of all nationalities have the right to use their own people's language in litigation. People's courts, people's procuratorates and public security organs shall translate for litigation participants that don't have a good understanding of the locally used language. In areas with concentrations of minority peoples or with several ethnic groups living together, the local language shall be used in trials and the local script used in releasing judgments, proclamations and other documents. Article 10: Cases tried by the people's courts implement a systems of a final judgment after two trials. Article 11: People's courts hearing cases, unless otherwise provided in this law, shall all be conducted publicly. The defendant has the right to a defense and the people's court have a duty to ensure the defendant receives a defense. Article 12: No person may be found guilty except by the lawful judgment of a people's court. Article 13: In cases tried by the people's courts, the people's assessor system should be implemented in accordance with this law. Article 14: The people's courts, people's procuratorates and public security organs shall guarantee criminal suspects', defendants' and other participants in the proceedings' right to a defense, and other procedural rights. Litigation participants have the right to submit an accusation against adjudicators, procurators and invesigators who infringe on citizen's procedural rights and cause personal insult. （6）other statutes provide for not pursuing criminal liability. Article 16: This law applies to foreigners who commit crimes and shall be pursued for criminal liability. Where foreigners who have diplomatic privilege and immunity commit a crime that shall be pursued for criminal responsibility, resolve it through diplomatic channels. Article 17: In accordance with treaties that the PRC has signed or participates in, or the principal of reciprocity, Chinese and foreign judicial organs may mutually request judicial assistance. Article 18: Unless the law provides otherwise, the investigation of criminal cases is performed by the public security organs. The peoples procuratorate will file and investigate crimes of bribery and corruption ; crimes of dereliction of duty by state workers; crimes of state workers abusing their power to effect an unlawful arrest, the coercion of confessions through torture, retaliation or illegal searches that violate citizen's personal rights and crimes that violate citizen's democratic rights. When it is necessary for the people's procuratorate to directly accept cases of state workers abusing their authority to carry out other serious crimes, the people's procuratorate may file and investigate the crime following a decision by a people's procuratorate of the provincial level or above. The people's courts will directly accept private prosecution cases. Article 19: Basic level people's court have jurisdiction over the first-instance trial of ordinary criminal cases, with the exception of those where the intermediate people's courts have jurisdiction under this law. （2）Cases that might result in a judgment of indeterminate imprisonment or death. Article 22: Cases over which the Supreme People's Court has jurisdiction of the first-instance trial are major criminal cases that effect the entire nation. Article 23: When necessary, higher level people's courts may try cases over which a lower court has jurisdiction of the first-instance trial. ; where a lower court feels a case is major and complicated, and needs to have the higher level court try the first-instance case, they may request that the higher court try it. Article 24: Jurisdiction of criminal cases is with the people's court at the site of the crime. If it is more appropriate, the people's court at the defendant's place of residence may have jurisdiction. Article 25: In cases where several people's courts at the same level have jurisdictional power, the first people's court to accept the case will try it. When necessary, it may be transferred to the site of the principal crime for trial. Article 26: Higher level people's courts may designate a lower level people's court to try a case where the jurisdiction is unclear, and may also designate that a lower court should transfer a case to another people's court for trial. Article 27: The jurisdiction of special people's courts is provided for elsewhere. Article 28: Adjudicators, procurators and investigators with the following circumstances shall recuse themselves; parties and their legally-designated representatives also have the right to request their recusal. (1) Is a party to the case or a paty's close relative. (4) has another relationship with a party in the case that might affect the just handling of the case. Article 29: Adjudicators, procurators, and investigators must not accept gifts or hospitality from parties and their agents, and must not meet with parties and their agents in violation of rules. Adjudicators, procurators, investigators violating the preceding paragraph shall be pursued for legal liability in accordance with law. Parties and their legal agents have the right to request their recusal. Article 30: The recusal of adjudicators, procurators and investigators shall be decided discretely by the court president, chief procurator and head of the public security organ; the recusal of a court president is decided upon by the adjudication committee of that court; the recusal of a chief procurator or head of a public security organ is decided upon by the prosecution committee of the people's procuratorate at the same level. Before a decision is issued on the recusal of an investigator, investigators cannot stop investigating a case. Parties and their legally-designated representatives may apply for one reconsideration of a decision to reject an application for recusal. Article 31: Provisions in this Chapter regarding recusal apply to court reporters, trainslators and evaluators. Defenders and agents ad litem may follow this chapter's provisions to request recusal and apply for reconsideration. （3）friends and family of the suspect or defendant. Persons who are currently serving a criminal sentence of have had their physical liberty limited or denied, may not serve as defenders. Article 33: From the day that the suspect is first interrogated or first has compulsory measures adopted against him, he has the right to retain a defender; during the investigation period, he may only retain a lawyer as a defender. Defendants have the right to retain a defender at any time. After the first interrogation of a criminal suspect or adoption of compulsory measures against a suspect, public security organs shall inform a suspect that he has the right to retain a defender. People's procuratorates shall inform a suspect of his right to retain a defender within 3 days of receiving a case's materials for review for prosecution. People's courts shall inform a defendant of his right to retain a defender within 3 days of receiving the case. If a detained suspect or defendant requests to retain a defender, the courts, people's procuratorates and public security organs shall promptly pass on the request. Detained criminal suspects or defendants may also have their guardian or close relatives retain a defender on their behalf. After a defender accepts the representation of a suspect or defendant, he shall promptly inform the case-handling organ. Article 34: Criminal suspects and defendants that have not retained a defender because of economic hardship or other reason, and their families, may apply to a legal aid organization. If they meet the requirements for legal aid, the legal aid organization shall appoint a lawyer to provide them a defense. The people's courts, people's procuratorates and public security organs shall notify the legal aid organization to appoint a lawyer to provide a defense for criminal suspects or defendants that might be sentenced to indeterminate imprisonment or death who have not retained a defender. Article 35: The defenders responsibility is to submit materials and opinions based on the facts that show that the suspect or defendant is not guilty or that his liability should be mitigated, commuted or excused; and to protect the procedural and other lawful interests of the suspect or defendant. Article 36: Defense lawyers may provide legal assistance to criminal suspects in the investigation phase, represent them in appeals and accusations, apply for modification of compulsory measures, learn the charges and circumstances from the investigating organs and submit comments. Article 37: Defense lawyers may meet and communicate with detained suspects or defendants. Other defenders may also meet and communicate with detained suspects or defendants after having gotten the permission of the peoples court and people's procuratorate. Detention centers shall promptly arrange a meeting, no later than 48 hours, for defense lawyers holding a lawyers' professional license, proof from a a law firm and a letter of representation or legal aid letter, and requesting to meet with a criminal suspect or defendant. Defense lawyers' meetings with criminal suspects during the investigation of cases of crimes that endanger national security, terrorist activities or especially serious bribery cases, shall be upon the permission of the investigating organ. In the cases described above, the investigating organ shall first inform the detention center. Defense lawyers meeting with detained criminal suspects or defendants may learn of the case circumstances and provide legal consultation etc. ; from the day that the case is transferred for review for prosecution, they may verify relevant evidence with the suspect or defendant. Defense lawyers are not listened in on when meeting with criminal suspects or defendants . Provisions of the first, third and fourth clauses apply to defense lawyers meeting and communicating with criminal suspects or defendants under residential surveillance. Article 38: Beginning the day that the case is transferred to the people's procuratorate to be reviewed for prosecution, defense lawyers may read, copy and reproduce a case's case file materials. 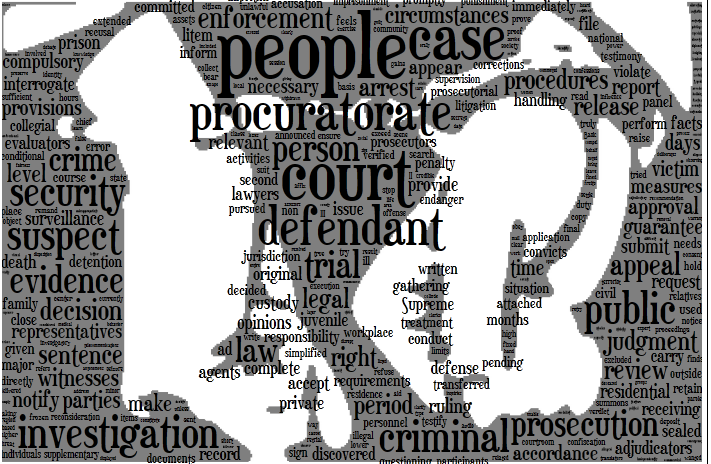 Article 39:Where the defender feels that the public security organ or people's procuratorate has gathered evidence in the investigation phase that shows the suspect or defendant is not guilty or that the offense was minor, and has not submitted it, he has the right to apply to the people's procuratorate or people's court to collect it. Article 40:Defenders that have gathered evidence about a suspect's alibi, not having reached the age of criminal liability, or being a mentally ill person that doesn't bear criminal responsibility under law, shall promptly inform the public security organs and people's procuratorate. Article 41: Defense lawyers may collect evidence from witnesses or other workplaces or individuals with their consent, they may also apply to the people's procuratorate or people's court to gather or collect evidence, or apply to the people's court to notify witnesses to appear in court to testify. Defense lawyers may collect materials relevant to the case from victims, their families or witnesses provided by the victim, with their consent, and authorization from a people's procuratorate or people's court. Article 42: Defenders, and all other persons, must not assist criminal suspects or defendants in concealing, destroying or fabricating evidence or colluding on testimony, and must not entice witnesses to give false testimony or do other things that disrupt the litigation activities of the judicial organs. Those violating the preceding paragraph shall be pursued for criminal liability, cases of defenders involved in crimes shall be handled by investigatory organs other than that handling the case in which the person is serving as a defender. If the defender is a lawyer, his law firm and lawyers association shall be promptly notified. Article 43:　In the course of trial, the defendant may refuse the defenders' continued defense, and may also separately retain a defender for his defense. Article 44:Victims in public prosecutions and their legally-designated representatives or close family members, and parties to attached civil lawsuits and their legally-designated representatives, have the right to retain an agent ad litem from the day the case is transferred for review for prosecution. The party initiating a private prosecution and their legally-designated representative, and parties to attached civil lawsuits and their legally-designated representatives, have the right to retain an agent ad litem at any time. Within three days of receiving the case materials for review for prosecution, the people's procuratorates shall inform victims and their legally-designated representatives or close relatives, and parties to attached civil litigation and their legally-designated representatives, that they have the right to retain an agent ad litem. Within three days of accepting a private prosecution shall inform the person initiating the private prosecution and his legally-designated representative, and the parties to attached civil lawsuits, that they have the right to retain an agent ad litem. Article 45:　Refer to the provisions of article 32 of this law for carrying out the retention of a an agent ad litem. Article 46:Defense lawyers have the right to preserve the confidentiality of their client's information relevant to the circumstances that they learn during the course of performing their professional activities. However, defense lawyers shall immediately report to the judicial organs on learning that their client or other persons are preparing to, or in the process of, perpetrating a crime that endangers national security or the public safety, or a crime that seriously endangers the physical safety of others. Article 47:Defenders or agents ad litem who feel that public security organs, people's procuratorates, or people's people's courts and their employees are obstructing the lawful exercise of their procedural rights, have the right to appeal or make an accusation to the people's procuratorate at the level above. People's procuratorates shall promptly investigate appeals or accusations, and if they are true, notify the relevant organ to make corrections. Article 48:　All materials that may be used to prove the facts of the case are evidence. (8) audio or visual materials and electronic data. Evidence must be verified as true before it can be the basis of a case decision. Article 49: In public prosecutions, the procuratorate bears the burden of presenting evidence that the defendant is guilty; in private prosecutions the private prosecutor bears the burden of presenting evidence that the defendant is guilty. Article 50:Adjudicators, procrators and investigators must follow statutory procedures in gathering evidence sufficient to show that a criminal suspect or defendant is guilty or not guilty and all kinds of evidence showing the severity of the crime. The extortion of confessions by torture, and other illegal evidence gathering methods such as enticement and trickery are strictly prohibited; no person may be forced to prove his own guilt. It must be ensured that all citizens related to the case, or who have knowledge of the case situation, are able to objectively and completely provide evidence, except in special situations, their assistance in investagations may be embraced. Article 51:　Approval of arrest documents submitted by public security organs, indictments by the people's procuratorates and judgments by the people's courts must be faithful to the factual truth. Those intentionally concealing the factual truth shall be pursued for responsibility. Article 52:　People's courts, people's procuratorates and public security organs have the right to gather and collect evidence from relevant workplaces and individuals. Relevant workplaces and individuals shall truthfully provide evidence. Evidence including physical evidence, documentary evidence, audio visual materials and electronic data collected by administrative organs in the course of administrative enforcement and case review may be used as evidence in criminal cases. Evidence that relates to national secrets, commercial secrets or personal privacy shall be kept confidential. Anyone who falsifies evidence, conceals evidence, or destroys evidence, regardless of what side they belong to, must be legally pursued. Article 53:Major evidence is needed in all aspects of a case decision, emphasizing investigation and research, not casually crediting confessions. When there is only a confession from the defendant, and no other evidence, the defendant can not be found guilty or sentenced, if there is no confession from the defendant, but the evidence is credible and sufficient, the defendant may be found guilty and sentenced. (3) All evidence of the case taken together, excludes all reasonable doubt as to the identified facts. Article 54:Criminal suspects or defendants' confessions gathered by the use of torture to extract confessions or other illegal methods or witness testimony or victim statements gathered by the use of illegal methods such as violence or threats, shall be excluded. Physical or documentary evidence gathered not in accordance with statutory procedures that might seriously influence judicial fairness, shall either be corrected or reasonably explained; if it can not be corrected or reasonably explained, the evidence shall be excluded. Where evidence that should be excluded is discovered during the investigation, review for prosecution or trial, it shall be excluded in accordance with law, and must not be used as the bases of an indictment opinion, a decision to indict, or a verdict. Article 55:People's procuratorate's receiving a report, accusation or internal report, or discovering that investigators have illegally gathered evidence, shall perform an investigation and confirmation. A corrective opinion shall be submitted where there is truly a situation of illegal evidence gathering; and pursue criminal liability if it comprises a crime. Article 56:If during the course of a courtroom trial, adjudicators find their might be a situation of illegal evidence gathering as provided in Article 54 or this regulation, they shall carry out a court room investigation on the legality of the evidence gathering. Parties, their defenders and agents ad litem have the right to apply to the people's court to have illegally gathered evidence excluded. Those applying to have illegally gathered evidence excluded shall provide relevant leads or other materials. Article 57:　In the course of carrying out a courtroom inquiry into the lawfulness of evidence gathering, the people's procuratorate shall provide proofs of the legality of the evidence gathering. If the evidentiary materials currently had cannot prove the legality of the evidence gathering, the people's procuratorate may request the people's court notify relevant investigatory personnel or other persons to appear in court to explian the situation. ; the people's courts may notify relevant investigatory personnel to appear in court to explain the circumstances. Relevant investigatory personnel or other persons may also request to appear in court to explain the situation. Upon the people's court's notification, relevant persons shall appear in court. Article 58:The evidence in question shall be excluded upon undergoing court room hearing confirming a situation of illegal evidence gathering as provided in Article 54 of this regulation or finding that such a situation cannot be excluded. Article 59:Witness testimony must be verified in court as true by prosecutors, victims and defenders before it can be the basis of a case decision. Where the court confirms that a witness has intentionally given false testimony or concealed evidence, it shall handle it in accordance with law. Article 60:Any person that knows the situation of a case has a duty to testify. A person who cannot distinguish right from wrong or clearly express themselves and a result of a physiological, psychological defecit or youth, can not be a witness. Article 61:People's courts, people's procuratorates and public security organs shall ensure the safety of witnesses and their close families. Those who threaten, insult, beat or attack or retaliate against witness or their close families, so as to constitute a crime, shall be pursued for criminal responsibility in accordance with law; where it not sufficient for criminal punishment, they shall be given an administrative security punishment in accordance with law. (5) Other necessary protective measures. Witnesses, appraisers and victims who feel they face threats to their personal safety or that of their family as a result of testifying in the course of litigation, may request that the people's courts, people's procuratorate and public security organs provide protection. Relevant workplaces and individuals shall cooperate with people's courts, people's procuratorates and public security organs lawfully adopting protective measures. Article 63:Witnesses incurring transportation, lodging and food expenses as a result of fulfilling their obligation to testify, shall receive a supplement. Witeness's supplement for testifying shall be included in the judicial organs' operating expenses and guaranteed by the finances of the government at the same level. When witnesses from a workplace testify, their workplace must not withhold or indirectly withhold their salary, benefits or other bennefits. Article 64: People's courts, people's procuratorates and public security organs may impose a custodial summons, release on guarantee pending further investigation or residential surveillance on a criminal suspect or defendant. （4） where the detention period is complete but the case is still underway and it is necessary to adopt release on guarantee pending further investigation. The public security organs enforce release on guarantee pending further investigation. Article 66:People's courts, people's procuratorates and public security organ deciding to release a suspect or defendant on guarantee pending further investigation shall order the suspect or defendant to submit a guarantor or a guarantee deposit. If the guaranteed person has violated the provisions of article 69 of this law and the guarantor has not carried out his guarantor duty, the guarantor will be fined, and if it constitutes a crime, pursued for criminal liability in accordance with law. (5) must not destroy or fabricate evidence, or collude testimony. (4) Give passports or other entry/exit documents and drivers' licenses to the enforcement organ for keeping. Suspects or defendants released on guarantee pending further investigation that violate the provisions of the proceeding two paragraphs and have already handed over a guarantee deposit, will have their guarantee deposit confiscated in part or in full and according to different circumstances, order the suspect or defendant to write a letter of repentance, provide a new guarantee deposit or guarantor, or be placed under residential surveillance or arrested. Criminal suspect or defendants that violate provisions of release on guarantee pending further investigation that need to be arrested may first be taken into custody. Persons providing a guarantee deposit shall deposit the guarantee in a special account at the bank designated by the enforcement organ. Article 71:When release on guarantee pending further investigation is concluded, criminal suspects or defendants who have not violated the provisions of article 69 of this law while released on guarantee pending further investigation, may bring their notice of removal of release on guarantee or relevant legal document to the bank to have their guarantee returned. (5) The period of detention is complete but the case has not been fully resolved so that it is necessary to employ residential surveillance. Suspects or defendants meeting the requirements for release on guarantee pending further investigation who cannot provide a guarantor or guarantee deposit,may be put under residential surveillance. Residential surveillance will be enforced by the public security organs. Article 73:Residential surveillance shall be enforced in the residence of the suspect or defendant; for those without a fixed residence, it may be enforced in a designated location. When crimes of endangering state security, terrorist activities or especially serious bribery cases are suspected, and enforcement in the residence might impede the investigation, it may also be enforced in a designated location upon the approval of the people's procuratorate or public security organ at the level above. However, it must not be enforced in a detention center or special case-handling area. Where residential surveillance is in a designated location the person under residential surveillance's family shall be notified within 24 hours, unless there is no way to inform them. Apply the provisions of article 33 for suspects or defendants under residential surveillance retention of a defender. The people's procuratorates supervise whether or not the decision to enforce residential surveillance and its enforcement are legal. Article 74:The period of residential surveillance in a designated location shall be subtracted from the sentence. One day shall be subtracted from a sentence of controlled release for each day spent under residential surveillance, for persons placed under short-term detention or a prison term, one day shall be subtracted for every 2 days under residential surveillance. (1) Must not leave the location of residential surveillance without the enforcing organ's permission. (6) hand over passports or other entry and exit documents, id cards or drivers licenses to the enforcing organ for keeping. When a suspect or defendant under residential surveillance violates the provisions of the preceding paragraph and the circumstances are serious, they may be arrested; if it is necessary to arrest, the suspect or defendant may first be taken into custody. Article 76:The organ enforcing residential surveillance may use electronic monitoring, unscheduled inspections and other surveillance methods on the suspect or defendant; in the investigation period, a suspect under residential surveillance's communications may be monitored. Article 77:When persons are placed under guarantee pending further investigation by the people's courts, people's procuratorates and public security organs, the period may not exceed 12 months, residential surveillance may not exceed 6 months. During the period of release on guarantee pending further investigation or residential surveillance, the investigation, prosecution and trial of the case must not be interrupted. Where it is discovered that criminal liability should not be pursued or the period for release on guarantee pending further investigation or residential surveillance is complete, the release or residential surveillance shall be removed. In removing release on guarantee pending further investigation or residential surveillance, the person under the release or residential surveillance and relevant workplaces shall be promptly informed. Article 78:Arrest of suspects or defendants must be decided upon by a people's procuratorate or people's court and will be enforced by public security organs. (2) there is a threat of endangering national security, public safety or the social order. (5) plan to commit suicide or escape. The suspect shall be arrested where there is evidence proving the facts of the crime and the possible punishment is 10 years or more imprisonment; or there is evidence proving the facts of the crime and the possible punishment is imprisonment or higher and the suspect has previous committed a crime of intentional infliction of harm or their identity is unclear. Suspects or defendants released on guarantee pending further investigation or under residential surveillance who violate the provisions of their release or residential surveillance may be arrested where the circumstances are serious. （3）Criminal evidence is discovered beside their person or in their domicile. （7）major criminal suspects that have committed crimes across regions, committed multiple crimes, or committed crimes as part of a gang. Article 81:　When public security organs take someone into custody or perform an arrest outside their territory, they shall notify the public security organ at the subject's location, and that public security organ shall cooperate. Article 82:　Any citizen may immediately seize and bring a person with the following characteristics to a public security organ, people's procuratorate or people's court for handling. After taking someone into custody, they shall immediately deliver the person in custody to be detained in a detention center, no later than 24 hours. The person taken into custody's family shall be notified within 24 hours of their being taken into custody, unless there is no way to contact them or it is a crime endangering national security or a terrorist activities crime where notification might obstruct the investigation. After the situation that would obstruct investigation has passed, they shall immediately inform the person in custody's family. Article 84:Public security organs shall interrogate a person taken into custody within 24 hours of taking them into custody. When it is discovered that a person should not have been taken into custody, they must be immediately released and given a proof of release. Article 85:When public security organs request the arrest of a criminal suspect, they shall write out and submit an arrest authorization certificate, and send it to the people's procuratorate, along with the case file and evidence, for approval. When necessary, the people's procuratorate may appoint someone to participate in the public security organ's discussion of major cases. （3）There might be major violations of law in the investigative activities. People's procuratorates performing a review for approving an arrest may question witnesses and other litigation participants and hear the defense lawyers opinions; when a lawyer submits a request, they shall hear the lawyers opinions. Article 87: People's procuratorates review and approval of the arrest of a criminal suspect is decided by the chief procurator. Major cases shall be submitted to the procurator commission to discuss and decide. Article 88:After the people's procuratorate carries out a review of a case submitted by the public security organs for approval of arrest, it shall make a decision on whether or not to approve the arrest on the basis of the situation. Where the decision is to approve arrest, the public security organs shall immediately enforce it, and promptly report notify the people's procuratorate of the circumstances of enforcement. Where arrest is not approved, the people's procuratorates shall explain their reasons, and where supplementary investigation is necessary, they shall inform the public security organ at the same time. Article 89:Where public security organs feel that a person in custody needs to be arrested, they shall submit it to the people's procuratorate for review to approve arrest within 3 days of taking the person into custody. In special circumstances the time for submitting for review for approval of arrest may be extended by 1-4 days. The time for submitting for review for approval of arrest may be extended to 30 days for those suspected of committing crimes across multiple regions, committing multiple crimes, or cases of gang crimes. The people's procuratorate shall issue a decision to approve arrest or not approve within 7 days of having received an arrest certificate submitted for approval by a public security organ. Where the people's procuratorate does not approve arrest, the public security organ shall immediately release the suspect upon receiving notification, and promptly notify the people's procuratorate of the enforcement circumstances. Where it is necessary to continue investigation and the requirements for release on guarantee pending further investigation or residential surveillance are met, they should be released on guarantee or put under residential surveillance in accordance with law. Article 90:When public security organs feel that the people's procuratorate's decision not to approve arrest was in error, they may request a reconsideration, but must immediately release the person in custody. If the opinion is not accepted, they may submit it for review to the people's procuratorate at the level above. The people's procuratorate at the level above shall review it immediately and issue a decision on whether or not to make changes, and notify the people's procuratorate and public security organ at the level below to enforce it. Article 91:When public security organs arrest someone, they must present an arrest warrant. 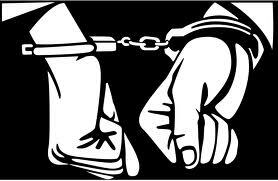 After arrest, the arrested person shall be brought immediately brought for detention in the lock-up. Unless there is no way to inform them, the family of the person arrested shall be notified within 24 hours of the arrest. Article 92:Public security organs must interrogate persons arrested upon the approval of the people's procuratorate within 24 of the arrest, as mus People's courts, and people's procuratorates for those persons whose arrest they decided. When it is discovered that a person should not be arrested, they must be immediately released and given a proof of release. Article 93: After the arrest of a criminal suspect of defendant, the people's procuratorate shall continue to review the necessity of detention. Release or a change of compulsory measures shall be suggested for those who do not not require detention be continued. The relevant organs shall inform the people's procuratorate of the circumstances of the disposition within 10 days. Article 94:The people's courts, people's procuratorates and public security organs shall immediately withdaw or change a compulsory measures against a suspect or defendant, if it is discovered that its adoption was improper. Public security organs releasing an arrested person or changing arrest methods shall notify the people's procuratorate originally approving it. Article 95:Criminal suspects or defendants their legally-designated representatives, close relatives, or defenders have the right to apply for a change in compulsory measures. People's courts, people's procuratorates and public security organs receiving an application shall issue a decision within 3 days; if not consenting to the change in compulsory measures, they shall notify the applicant and explain the reason for not consenting. 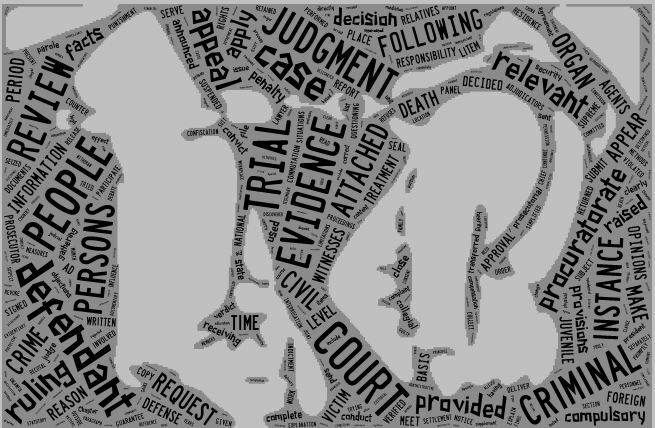 Article 96:In cases where the criminal suspect or defendant is detained and the case cannot be resolved within the periods for investigatory detention, review of prosecution, and first and second instance trials, the suspect or defendant shall be released, where it is necessary to continue reviewing evidence, the suspect or defendant may be released on guarantee pending further investigation or placed under residential surveillance. Article 98:People's procuratorates discovering in the course of review for approval of arrest that there were violations by the public security organs in investigation activities, shall notify the public security organ to make corrections and the public security organ notify the procuratorate of the correction circumstances. Article 99:Where the victim has suffered material losses as the result of the defendant's criminal acts, he has the right to raise an attached civil suit in the course of the criminal prosecution. Where the victim has died or become incapacitated, the victim's legally-designated representative or close relatives have the right to initiate an attached civil suit. If state assets or collective property has suffered losses, the people's procuratorate may initiate an attached civil suit when it initiates the public prosecution. Article 100:When necessary, people's courts may adopt security measures, sealing, seizing or freezing the defendant's assets. The attached civil suit's plaintiff or the people's procuratorate may apply to the people's court to adopt security measures. Apply the relevant provisions of the Civil Procedure law for the people's courts' adoption of security measures. Article 101:People's courts trying attached civil suits may perform mediation or make a ruling or judgment on the basis of the situation of the loss. Article 102:Attached civil suits shall be tried together with criminal prosecutions, and only tried after the criminal trial to prevent the excessive delay of the criminal trial, with the same trial organization then continuing on to hear the attached civil case. Article 103:	Time periods are calculated in hours, days and months. The hour and day in which the period begins are not calculated into the time period. The statutory time period do not time spent in transit. Petitions for appeals or other documents already mailed when the time period is completed will not be considered untimely. Where the final day of a time period is a work holiday, the first day following the end of the holiday will serve as the final day of the time period, but suspects' or defendants' periods of detention shall be complete on the day the time period ends and must not be extended because of a holiday. Article 104: If due to force majeure or other legitimate reason a party misses a time period, he may apply to continue the litigation activity that should have been completed before the time period was completed. Whether the application in the preceding paragraph will be approved is to be decided by the people's courts. Article 105: Delivery of subpoenas, notifications and other litigation documents shall be made to the recipient in person, if the person is not present, the may be to his adult family members or the responsible-party at his workplace on his behalf. When a recipient or person receiving on his behalf refuses to accept , or refuses to sign his name or affix a seal, the deliverer may invite his neighbors or other witnesses to appear and explain the circumstances, and leave the documents at the residence; recording the refusal, the date of delivery and the deliverer's signature on the document, and considering it will be considered delivered. (5) "agent ad litem" refers to a person retained to participate as a representative in litigation by the victim in a public prosecution and his legally-designated representative or close family members, or by the private prosecutor or his legally-designated representative in a private prosecution, or by parties to an attached civil litigation or their legally-designated representatives. (6) "close relatives" [or "close family members"] refers to husbands, wives, fathers, mothers, sons, daughters and full siblings. Article 107: Public security organs or people's procuratorates discovering case facts or a criminal suspect shall file and investigate a case according to the scope of their jurisdiction. Article 108:Any workplace or individual discovering facts of a crime or a criminal suspect has both the right and also the duty to report it to the public security organs, the people's procuratorates or the people's courts, or the report it to superiors. Victims have a right to report crimes or suspects that violate their rights in their person or assets to the public security organs, people's procuratorates or people's courts, or make an accusation. Public security organs, people's procuratorates and people's courts shall accept reported cases, accusations and internal reports. Those not within their own jurisdiction shall be transferred to the organ with principal jurisdiction for disposition, and the person reporting the case, making the accusation or reporting internally shall be notified; in those not within their jurisdiction that need to have emergency measures taken, emergency measures should be adopted and it should then be transferred to the organ with principal jurisdiction. The provisions of the third paragraph apply where the offender turns himself in to the public security organ, people's procuratorate or people's court. Article 109:Reporting a case, making an accusation, or internal reporting may be done in writing or orally. Personnel receiving an oral report of a case, accusation or internal report shall write it into a record and after reading it to ensure it has no errors, the person reporting, the accuser or the internal reporter shall sign their name or affix their seal. Personnel receiving an accusation or internal report shall explain the legal liability for lodging a false charge to the accuser or internal reporter. However, as long as the story isn't concocted or the evidence fabricated, even if the accusation or internal report has factual discrepencies or is a wrongful accusation, a sharp distinction must be drawn between it and lodging a false charge. Public security organs, people's procuratorates or people's courts sahll ensure the safety of persons reporting cases, accusers and internal reporters as well well as their families. If persons reporting cases, accusers or internal reporters are unwilling to disclose their names their actions in reporting the case, accusing or internally reporting, their confidentiality shall be protected. Article 110:People's courts, people's procuratorates or public security organs shall quickly begin an investigation when receiving a report, accusation, or internal report, in accordance with the scope of their jurisdiction, and when they find that the facts of the case require that criminal responsibility be pursued, they shall file a case; when they find that there is no crime, or that the the crime is clearly minor and doesn't require pursuit of criminal responsibility, a case is not filed and theaccuser is notified of the reason for not filing a case. If the accuser is not satisfied with the decision, he may apply for a reconsideration. Article 111:Where the people's procuratorate feels that the public security organ has not filed and investigated a case where it should do so, or the victim feels that the public security organ has not filed and investigated a case where it should do so and submits it to the people's procuratorate, the people's procuratotrate shall request that the public security organ explain the reason for not filing a case. If the people's procuratorate feels that the public security organ's reason for not filing the case is not sustainable, it shall notify the public security organ to file the case and after receiving the notice, the public security organ will file the case. Article 112:In private prosecutions, the victim has the right to directly initiate a suit with the people's court. If the victim is dead or has lost capacity to act, the victim's legally-designated representative or close relatives have the right to file suit with the people's court. The people's court shall accept the case in accordance with law. Article 113:Public security organs shall carry out investigations of cases that have already been filed, and gather or collect evidence showing whether the suspect is guilty or not-guilty, and whether the crime was minor or serious. Persons caught in the act or major suspects may be taken into custody in accordance with law, those suspects meeting the requirements for arrest shall be arrested in accordance with law. Article 114:Public security organs that through investigation have evidence proving the facts of the crime shall carry out trial preparation, and verify all evidentiary materials that have been gathered or collected. (5) Corruption, misappropriation, embezzlement, or exchanges, in violation of the rules for sealing, seizing and freezing property. Organs accepting appeals or accusations shall promptly handle them. Those not satisfied with the disposition may appeal to the people's procuratorate at the same level; cases directly accepted by the people's procuratorate, may be appealed to the people's proscuratorate at the level above. The people's procuratorates shall immediately begin a review of the appeal, and if it proves true, notify the relevant organ to make corrections. Article 116:Investigators from the people's procuratorates or public security organs must be responsible for conducting the interrogation of suspects. When interrogating, there must be at least 2 investigators. When a suspect is delivered to a detention center for detention, investigators interrogating him shall do so inside the detention center. Article 117:Criminal suspects that do not need to be taken into custody or arrested may be summoned to a location in the city or county where they reside or interrogated in their residence, but credentials from the people's procuratorate or public security organ shall be displayed. Criminal suspects discovered at the scene may be orally summoned upon presentation of credentials, but this circumstance shall be noted in the interrogation records. The period for summons and custodial summons must not exceed 12 hours, if the case is particularly major or complicated and needs to take a suspect into custody or make an arrest, the period of summons or custodial summons must not exceed 24 hours. Consecutive summonses and custodial summonses must not be used to covertly confine a criminal suspect. When suspects are summoned or put under custodial summons, their food, water and necessary rest time shall be ensured. Article 118:When interrogating a suspect, investigators shall first ask whether the suspect has committed a crime and let him describe the circumstances of the crime or explain that there is no crime, and then ask him questions. Suspects shall truthfully answer investigators' questions. However，they have the right to refuse to answer questions that are not not relevant to the case. When investigators interrogate suspects, they shall inform the suspect of legal provisions that truthfully describing his own offense may result in leniency. Article 119:When interrogating deaf or mute suspects, a person who understands sign language shall participate and this situation shall be noted in the interrogation records. Article 120:The interrogation record shall be checked by the suspect, and where subjects cannot read, it shall be read to him. If there are omissions or errors in the record, the suspect may supplement or correct. After a suspect accepts that the record has no errors, he shall sign or affix a seal. Investigators shall also sign the record. Where suspects request to write a statement themselves, it shall be permitted. When necessary, investigators may also request that the suspect write his own statement. Article 121:When investigators interrogate a criminal suspect, they may make audio or video recordings of the interrogation process, for suspects that might be sentenced to life in prison or death, or in other major criminal cases, they shall make an audio or video recording of the interrogation process. Audio or video recording shall be made of the entire process, to preserve their integrity. Article 122:Investigators may question witnesses at the scene, and may also go to a witness's workplace or resident or a place suggested by the witness to conduct the questioning; when necessary, they may notify the witness to appear at the people's procuratorate or public security organ to provide testimony. Work credentials shall be displayed when questioning witnesses at the scene, and supporting documents from the people's procuratorate or public security organ shall be displayed when questioning witness at their workplace, residence or a place suggested by the witness. Witnesses shall be interviewed individually. Article 123:When questioning witnesses, they shall be notified that they shall truthfully provide evidence and testimony and that those who intentionally fabricate or conceal evidence will bear legal responsibility. Article 124:The provisions of article 120 of this law also apply to questioning witnesses. Article 125:The provisions of this section apply to the questioning of witnesses. Article 126:Investigators shall conduct an inquest or inspection of all sites, items, persons or corpses related to the crime. When nescessary, persons with expert knowledge may be appointed or hired to carry out the inquest or inspection over which inspectors preside. Article 127:All workplaces and individuals have the duty to preserve crime scenes and promptly notify public security organs to appoint someone to perform an inquest. Article 128:Investigators performing an inquest or inspection must carry supporting documents from the people's procuratorate or public security organ. Article 129:The public security have the right to decide to perform an autopsy on bodies for which the cause of death is unclear, and to notify the deceased's family to appear. Article 130:Physical inspections may be performed to determine victims' or suspects' characteristics, physiological state or the circumstances of injury; fingerprints, blood and urine samples may be taken. If suspects refuse the inspection, investigators may compel it when they feel it is necessary. Physical inspections of women shall be performed by female personnel or doctors. Article 131:A record shall be written for inquests and inspections, and signed by the personnel participating in the inquest or inspection and the witnesses, and their seals affixed. Article 132:When the people's procurate is reviewing a case and feels there is a need to re-conduct the public security organ's inquest or inspection, it may request that the public security organ re-inspect or re-conduct the inquest, and may assign procuratorate personnel to participate. Article 133: Investigative experiments may be carried out, when necessary to clarify the case facts, with the permission of the responsible person at the public security organ. A record shall be written of the circumstances of an investigative experiment and signed or sealed by participants to the experiment. All behavior that creates a threat or injury to personages and all indecent behavior is prohibited in investigative experiments. Article 134:For the purpose of gathering criminal evidence or capturing criminal, investigators may search the person, goods, residences and other relevant places of suspects as well as people that might conceal a crime or criminal evidence. Article 135:All workplaces and individuals have the duty to comply with requests from the people's procuratorate to hand over physical evidence, documentary evidence, audio-visual recordings or other evidence that might prove the suspect's guilt or innocence. Article 136:When conducting a search, a search warrant must be presented to the subject of the search. When conducting an arrest or taking someone into custody, a search may be carried out without a search warrant in emergency circumstances. Article 137:When conducting a search, the subject of the search, his family, neighbors or other witnesses shall be present. Searches of women's bodies shall be carried out by female personnel. Article 138:A record shall be made of the circumstances of searches, and it shall be signed or sealed by the searchers and the subject of the search or his family, neighbors or other witnesses. It shall be noted on the record if the subject of the search or his family flee or refuse to sign or affix their seal. Article 139:All kinds of assets or documents discovered during investigation activities that may be used to prove the suspects guilt or innocence shall be seized and sealed; assets and documents with no relation to the case must not be seized or sealed. Assets or documents that are seized and sealed must be properly safeguarded or stored, and must not be used, exchanged or damaged. Article 140:Assets or documents that are sealed or seized shall be clearly inventoried and listed listed in duplicate at the scene by witnesses or the person holding the assets or documents that are being seized and sealed; and the investigators, witnesses and person holding the items shall sign and seal the list, with one copy being given to the person holding the items and one copy being placed in the file for future reference. Article 141 :When investigators feel it is necessary to seize criminal suspects mail or telecommunications, they may notify the the postal and telecommunications organs to hand over the relevant mail and telecommunications for seizure. When it is not necessary to continue the seizure, the postal and telecommunications organs should be notified without delay. Article 142:People's procuratorates and public security organs may follow regulations to make inquiries into and freeze a criminal suspect's savings, remittances, bonds, stocks, shares in fund and other assets, as required by the case investigation. Relevant units and individuals shall cooperate. Once frozen, a criminal suspect's savings, remittances, bonds, stocks, shares in funds and other assets must not be repeatedly frozen. Article 143:Within three days of clarification that they are unrelated to the case, sealed or seized property, mails and telegrams or frozen savings, remittances, bonds, stocks, shares in funds or other assets shall have the sealing, seizure or freezing withdrawn. Article 144:When it is necessary to resolve a few specialized problems in a case to ascertain the case circumstances, a person with expert knowledge shall be appointed or hired to perform an evaluation. Article 145 :After an evaluator performs an evaluation, he shall write out an assessment opinion and sign his name. An evaluator who intentionally makes a false evaluation shall bear legal responsibility. Article 146:　Investigatory organs shall inform suspects and victims of evaluation opinions that will be used as evidence. If a suspect or victim submits a request, a supplementary evaluation or new evaluation may be done. Article 147:　The period spent conducting a psychiatric evaluation of the suspect is not included in the case handling period. Article 148:After the public security organs file a case, they may use technical investigative measures, as necessary for the investigation, in cases of crimes that endanger national security, terrorist activities, mafia-type organization crimes, major drug crimes, or other crimes that seriously endanger society, upon having completed strict approval procedures. After filing a case, the people's procuratorate may adopt technical investigative measures to be carried out by the organ designated in regulated, as is necessary for the investigation of major corruption or bribery cases as well as for crimes of abuse of public office to violate citizen's rights, upon completion of strict procedures. With approval, the necessary investigative measures may be employed for the pursuit of a fleeing suspect or defendant that has been declared wanted or is subject to an approved arrest decision. Article 149:The approval decision shall be based on the needs of the criminal investigation, confirming the type of investigative measures to be employed and their target. The approval decision is effective for three months from the date on which it is signed and issued. Where it is not necessary to continue employing technical investigative measures, they shall be promptly ceased; where the period is completed in a complicated or challenging case and it is still necessary to continue employing technical investigative measures, the period may be extended upon approval, but each time must not exceed 3 months. Article 150:Technical investigative measures must be carried out in strict accordance with the type, target and time limits set out in the approval. Investigators who become aware of state secrets, commercial secrets or private personal information during the course of employing technical investigative measures shall preserve their secrecy, information unrelated to the case that is acquired through the use of technical investigative measures must be promptly destroyed. Materials gathered through the use of technical investigative measures can only be used in criminal investigation, prosecution and adjudication, and cannot be used for other purposes. When public security organs adopt technical investigative measure, relevant workplaces and individuals shall cooperate and maintain the confidentiality of the relevant circumstances. Article 151:Relevant persons may conceal their identity to carry out investigations with the permission of the responsible person at the public security organ when necessary to clarify case facts. However, they must not induce others to commit a crime, and must not adopt methods that endanger public safety or cause a major threat to personal safety. For criminal activities involving trade in drugs or other prohibited substances and property, the public security organs may follow regulations to carry out controlled deliveries on the investigations needs. Article 152:Materials gathered by through investigative measures in accordance with this section may be used as evidence in criminal prosecutions. If using this evidence might endanger relevant personnel's physical safety or might create other serious consequences, protective measures such as not revealing the relevant persons' identities, or technical methods shall be adopted, and when necessary, evidence may be verified by adjudicatory personnel outside of the court room. Article 153:If a criminal suspect that should be arrested flees, the public security organs may release a wanted notice and adopt effective measures to apprehend them and bring them to justice. Public security organs at every level may directly release wanted orders within their geographic jurisdiction; for those extending beyond their geographic jurisdiction, they shall notify the public security organ at a level above which has the power to decide on and make the release. Article 154:Post-arrest Investigative detention of suspects must not exceed 2 months. Where the circumstances are complicated, and the case cannot be concluded at the completion of the time period, it may be extended for one month on the approval of the people's procuratorate at the level above. Article 155:When special circumstances make a particularly serious and complicated case unsuited for judgment for an extended period, the Supreme People's Procuratorate will report the situation to the standing committee of the National People's Congress for approval of an extension. （4）major, complicated cases involving a large area making it difficult to gather evidence. Article 157:Where suspects might be sentenced to a penalty of 10 years or more imprisonment, and the extended period provided in article 156 of this law is complete but the investigation can still not be closed, it may be again extended for 2 months upon an approval decision from the people's procuratorate at the provincial, autonomous region, or directly controlled municipality level. Article 158:Where it is discovered during the investigation period that the suspect has committed other major offenses, follow article 154 of this law in restarting the period of investigatory detention from the date of discovery. Where a suspect does not state his true name or address and his identity is unclear, an investigation into his identity shall be performed, and the period of investigative detention will be calculated from the day on which his identity is clarified, but the gathering of evidence on his crime must not cease. Where the facts of the crime are clear, and the evidence is credible and sufficient, but there is truly no way to discover their identity, he may be prosecuted and tried under the name he gives. Article 159:If before the investigation is concluded the defense lawyer so requests, the investigating organ shall hear the lawyer's opinions and note them in the case. Where the defense lawyer submits written opinions, they shall be attached to the file. Article 160:Cases where the public security organs' investigation is completed shall have the facts made clear, the evidence been found credible and sufficient, and that this is written in their prosecution opinion and sent to the peoples procuratorate at the same level, along with the case file materials and evidence, for review and decision; at the same time, the suspect and his defense lawyer shall be notified of the circumstances of the case. Article 161:Where it is discovered during the course of investigation that the criminal suspect should not be pursued for criminal responsibility, the case shall be withdrawn; suspects that are already arrested shall be immediately released and issued a proof of release, and the people's procuratorate originally approving the arrest shall be notified. Article 162:The provisions of this chapter apply to investigations in cases directly accepted by the people's procuratorates. Article 163:In cases directly accepted by the people's procuratorates that meet the requirements of articles 79 and article 80 paragraphs 4 and 5,of this law, where arrest or taking the suspect into custody is necessary, the people's procuratorate shall issue the decision and the public security organs shall implement it. Article 164:Persons taken into custody in a case directly accepted by the people's procuratorate shall be interrogated within 24 hours of having been taken into custody. When it is discovered that a person should not have been taken into custody, they must be immediately released and given a proof of release. Article 165:When the people's procuratorate feels it is necessary to arrest a person taken into custody in a case it directly accepted, it shall issue a decision within 14 days. In special circumstances, the time for making an arrest decision may be extended 1 to three days. Those who do not need to be arrested shall be immediately released; if continued investigation is necessary and the requirements for release on guarantee pending further investigation or residential surveillance are met, they may be released on guarantee or put under residential surveillance. Article 166:In cases where the people's procuratorate has completed an investigation, it shall issue a decision to prosecute, not prosecute or withdraw the case. Article 167:All cases that require the initiation of a prosecution will be reviewed and decided upon by the people's procuratorate. （5）whether investigative activities were lawful. Article 169 :The people's procuratorates shall issue a decision on cases submitted by the public security organs for prosecution within 1 month; this may be extended by a half-month in major, complicated cases. In cases reviewed for prosecution by the people's procuratorate where the jurisdiction is changed, the time limit for review is calculated from the day that the people's procuratorate receives the case after the change. Article 170 :People's procuratorates investigating a case shall interrogate the criminal suspect, hear the opinions of the defender, victims and their agents ad litem, and make records in the case file. When defenders, victims or their agents ad litem submit written comments, they shall be attached to the file. Article 171:Peoples procuratorates reviewing cases may request the public security organs provide all evidence that the court needs for trial; where it is found that there might be a situation of illegal evidence gathering as provided for in article 54 of this law, it may be requested that they explain the legality of the evidence gathering. People's procuratorates reviewing a case for which supplemental investigation is needed may send it back to the public security for supplementary investigation, and may also carry out an investigation themselves. In supplementary investigation cases, the supplementary investigation shall be closed within one month. Only two supplementary investigations may be conducted. After the supplementary investigation is completed and transferred to the people's procuratorate, the people procuratorate time period for review starts anew. Where the people's procuratorate still feels that the evidence is insufficient and does not meet the requirements for initiating a prosecution after two supplementary investigations, it shall issue a non-prosecution decision. Article 172:The people's procuratorate shall issue a decision to prosecute where it finds the facts of the suspect's crime are already clear, the evidence is credible and sufficient, and criminal liability should be pursued in accordance with law; a public prosecution shall be submitted to the people's court on the basis of trial jurisdication and the case file and evidence shall be sent to the court. Article 173:Where there are no facts showing the suspects' crime or in any of the circumstances provided for in article 15 of this law, the people's procuratorate shall issue a non-prosecution decision. Where the circumstances of the crime are slight and, in accordance with the Criminal Law ,it is not necessary to give a criminal penalty or a criminal penalty may be excused, the people's procuratorate may issue a non-prosecution decision. In cases where the people's procuratorate decides not to prosecute, it shall, at the same time, release any property that it has sealed, seized or frozen. Where the person not being prosecuted needs to be given an administrative punishment, administrative sanction or needs to have unlawful gains confiscated, the people's procuratorate shall submit a procruatatorial opinon and send it to be handled by the relevant organ. The relevant organ shall promptly notify the people's procuratorate of the outcome of the handling. Article 174 :Decisions to not prosecute shall be publicly announced and the decision shall be sent to the person not being prosecuted and their workplace. If the person not being prosecuted is detained, they shall be released immediately. Article 175 :Where the people's procuratorate decides not to prosecute a case transferred to it by a public security organ, it shall send the non-prosecution decision to the public security organ. When the public security organ feels that the decision not to prosecute was in error, it may request a reconsideration, if this opinion is not accepted, it may request a review from the people's procuratorate at the level above. Article 176 :In cases given a non-prosecution decision where there are victims, the people's procuratorate shall send the decision to the victims. If the victims are unsatisfied, they may appeal to the people's procuratorate at the level above within 7 days of receiving the decision documents and request a prosecution be initiated. The people's procuratorate shall inform the victim of its review decision. Where the people's procuratorate maintains its decision not to prosecute, the victims may file a prosecution in the people's court. The victims may also directly file a prosecution with the people's court without having appealed. After the people's court accepts the case, the people's procuratorate shall transfer the relevant case materials to the people's court. Article 177 :In cases where the people's procuratorate issues a decision not to prosecute under paragraph 2 of article 173 of this law, if the person not being prosecuted is unsatisfied, he may appeal to the people procuratorate within 7 days of receiving the decision. the people's procuratorate shall issue a review of the decision , notify the person not being prosecuted and send a copy to the public security organ at the same time. Article 178:Basic and intermediate level people's courts hearing first-instance trial of cases, shall have 3 trial adjudicators, or a combination of adjudicators and people's assessors totaling 3 people, form a collegial panel for trial, but cases in which the basic level courts apply summary procedures may be heard by a single adjudicator. In cases where the high people's courts or the supreme people's court hear the first-instance trial, 3-7 adjudicators, or a combination of adjudicators and people's assessors totalling 3-7 people shall for a collegial panel for trial. People's assessors performing their duties in the people's courts have the same level of rights as adjudicators. Courts hearing appeals and prosecutorial counter-appeals, will be heard by 3-5 adjudicators forming a collegial panel for trial. The collegial panel should have an odd number of members. The chief judge shall appoint an adjudicator from the collegial panel to serve as the presiding judge. When the court president or chief judge participates in the trial of a case, he shall serve as the presiding judge himself. Article 179: When the collegial panel deliberates, if there is a difference of opinions, the majority opinion shall be followed in issuing a decision, but the minority opinion shall be written in the record. The deliberation records shall be signed by the members of the collegial panel. Article 180:After the collegial panel has tried the case and deliberated, it shall issue a judgment. For difficult, complicated or major cases, where the collegial panel finds it difficult to issue a decision, the collegial panel will request that the court president give it to the adjudication committee for discussion and decision. The collegial panel shall implement the adjudication committee's decision. Article 181:After performing review of a case submitted for public prosecution, the people's courts shall decide to try those that clearly state a criminal offense. Article 182:After deciding to hear the case, people's courts shall confirm the members of the collegial panel, and send a copy of the people's procuratorates indictment to the defendant and his defender no later than 10 days before trial begins. Before court is in session, adjudicators may bring together the prosecutors, parties, defenders and agents ad litem to understand learn about and hear opinions on trial issues such as recusal, the list of witnesses to appear in court and exclusion of evidence. After the people's court has confirmed the date it shall notify the people's procuratorate of the time and place for trial, summon parties, notify the parties, agents ad litem, witnesses, evaluators and translators; summonses and notices should be delivered no later than three days before the opening of trial. In cases where the trial will be public, the cause of action, the defendant's name and the time and place of the trial shall be publicly announced 3 days before trial. The circumstances of the above activities shall be written into the record and the adjudicators and clerks shall sign it. Article 183:First-instance trials in the people's courts shall be tried publicly. However, cases involving state secrets of private personal information shall not be tried publicly; cases that involve commercial secrets may have close trials if a party so applies. Cases where the trial is close shall have the reason for the trial being closed announced in court. Article 184:When people's courts hear public prosecutions, the people procuratorates shall appoint someone to appear in court and support the prosecution. Article 185:When court opens session, the presiding judge will verify if the parties have appeared and announce the cause of action and announce the names of the collegial panel members, clerks, prosecutors, defenders, agents ad litem, evaluators and translators; he shall inform the parties that they have the right to apply for the recusal of collegial panel members, clerks, evaluators and translators, and inform the defendant he has the right to a defense. Article 186:After the prosecutors have read the indictment in court, the defendant and victims may make statements regarding the alleged crimes, and the prosecutors may interrogate the defendant. Victims, plaintiffs in attached civil suits, defenders and agents ad litem may pose questions to the accused with the permission of the presiding judge. Adjudicators may interrogate the defendant. Article 187:Where prosecutors, parties, defenders or agents ad litem object to a witness's testimony that has a major bearing on the case verdict or sentencing and the people's courts find that it is necessary for them to testify in court, the witness shall appear in court to testify. The preceding paragraph applies to people's police appearing in court to testify on criminal circumstances they personally witnessed while carrying out their professional duties. Where prosecutors, parties, defenders, or agents ad litem object to evaluation opinions and the people's courts find that evaluators need to appear in court, the evaluators shall appear in court to testify. Where upon notice from the people's court, evaluators refuse to appear in court to testify, the evaluation opinion must not be the basis of the verdict. Article 188:Where upon notice by the people's court, witnesses do not appear in court to testify without a legitimate reason, the people's court may compel their appearance, with the exception of the defendant's spouse, parents and children. Witnesses refusing to appear in court or refusing to testify when appearing, with no legitimate reason, will be admonished and where the circumstances are serious, may be taken into custody for up to 10 days with the court presidents' permission. If the person being punished is dissatisfied with the decision to take him into custody, he may apply for a reconsideration to the people's court at the level above. Implementation does not stop during the period of reconsideration. Article 189:Adjudicators shall inform testifying witnesses that they should provide testimony truthfully and that those intentionally giving false testimony or concealing a crime will bear criminal responsibility. Prosecutors, parties, defenders, and agents ad litem may question witnesses and evaluators with the permission of the chief judge. When the chief judge feels that the content of the questioning is irrelevant to the case, he shall stop it. Adjudicators may question witnesses and evaluators. Article 190:Public prosecutors and defenders shall present physical evidence to the court, have the parties make identifications, and should read aloud in court the testimony of witness's not appearing, the investigation records and other documents serving as evidence. Adjudicators shall hear the opinions of the prosecutor and parties and defenders and agents ad litem. Article 191: Where in the course of courtroom trial the collegial panel has doubts about the evidence, an adjournment of court may announced to carry out an investigation and verification. 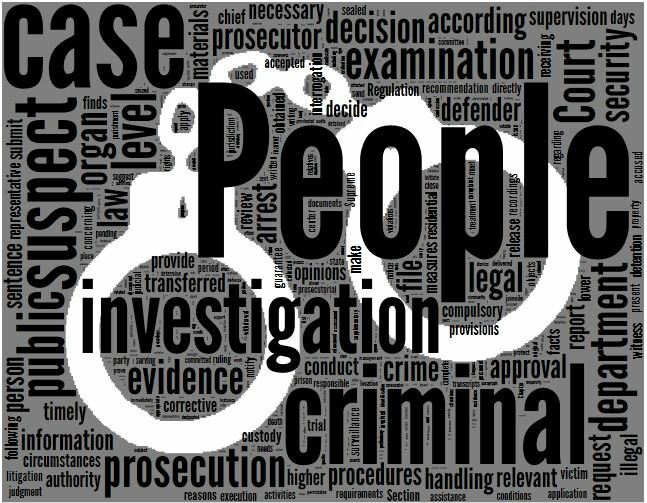 People's Court's investigating and verifying evidence, may carry out inquests, inspections, sealing of property, seizures, evaluations, queries, and freezing of assets. Article 192:During the course of courtroom trial activity, the parties, defenders and agents ad litem have the right to apply to the court to have new witnesses notified to appear, to have new physical evidence collected, or to apply for a new evaluation or inquisition. Public prosecutors, parties and defenders or agents ad litem may apply to the court to notify persons with expert knowledge to appear in court and put forward opinions on expert evaluators' evaluations. The court shall issue a decision on whether or not it consents to the above requests. The relavant provisions for evaluators apply to appearances in court by people with specialized knowledge provided for in the second clause. Article 193:All evidence and matters related to conviction and sentencing shall be investigated and debated during the course of trial at court. With the permission of the court, the prosecutor, parties, defender and agents ad litem may comment on the evidence and case situation as well as debating each other. After the presiding judge announces that debate has concluded, the defendant has the right to make a final statement. Article 194:In the course of trial at court, if participants to the proceedings or observers violate courtroom order, the chief judge shall warn them to stop. Those that comply with the warning may be compelled to leave the courtroom and, if the circumstances are serious, fined not more than 1000 yuan or taken into custody for not more than 15 days. These fines and custody must be approved by the court president. If the person punished is not satisfied with the decision to fine him or take him into custody, he may request reconsideration from the people's court at the level above. Enforcement does not stop during the period of reconsideration. Criminal responsibility should be pursued for assembling crowds to create a commotion or rush the courtroom; insulting, defaming, threatening or attacking judicial personnel or litigation participants; and serious disruptions of courtroom order; if they constitute a crime. （1) A guilty ruling shall be issued where the facts of the case are clear, the evidence is reliable and sufficient, and the defendant is verified as guilty in accordance with law. （3）A ruling of not-guilty as the alleged crime could not be established due to insufficient evidence shall be issued where the evidence is insufficient to verify that the defendant is guilty. Article 196:The announcement of verdicts shall be done publicly. Where judgments are announced in court, the written judgement shall be sent to the parties and the procuratorate that raised the prosecution within 5 days, for judgments released at a set time, the written judgment shall be immediately sent to the parties and the procuratorate that raised the prosecution. The written judgments shall be sent to the defender or agent ad litem at the same time. Article 197:Written judgments should be signed by the adjudicators and clerks, and further state the time limits for appeal and the court of appeals. (1) It is necessary to notify new witnesses to appear in court , to collect new physical evidence, or the hold a new appraisal or inquisition. (2) Procurators discover that a case raised for prosecution requires supplementary investigation and make a suggestion. (3) Trial cannot be conducted because of an application for recusal. Article 199:In cases where trial is extended in accordance with the provisions of the second clause of article 198 of this law, the people's procuratorate shall complete supplementary investigation within one month. (4) due to reasons that cannot be controlled. Trial should be resumed when the reasons for the suspension have disappeared. The period of suspension is not calculated into the time for trial. Article 201:All courtroom trial activities shall be written into a record by the court reported and upon review by the chief judge, signed by the chief judge and the court reporter. The portion of the court record on witness's testimony shall be read aloud in court or given to the witness to read. After witnesses concede that there are no mistakes, they shall sign their name or affix their seal. The court record shall be given to the parties or read out to them. Where a party feels that the record has omissions or errors, he may request supplementation or correction. After a party concedes there are no mistakes he shall sign it or affix his seal. Article 202:People's courts trying public prosecutions shall announce a verdict within 2 months of accepting the case, and may not exceed 3 months at the latest. Upon authorization by the court above, cases where the death penalty might be issued or attached civil litigation, as well as those that have any of the circumstances provided for in article 156 of this law, may be extended by three months; where special circumstances require further extensions, the circumstance is reported to the Supreme People's Court for approval. In cases where the people's courts have changed jurisdiction, the trfial period begins counting from the day on which the people's court receives the case after jurisdiction has been changed. In cases where the people's procuratorate supplements investigation, after the supplemental investigation is complete and sent to the people's court, the people's court newly calculates the trial period. Article 203:People's procuratorates discovering that a court trial of a case violates the procedures provided by law, have the right to issue a corrective opinion to the court. (2) the victim has evidence to prove a minor criminal case. (3) Cases where the victim has evidence proving that the defendant's conduct in violation of his personnel or property rights should be pursued for criminal responsibility, but the public security organs of people procuratorate do not seek the the defendant's criminal responsibility. (1) Cases where the facts of the crime are clear and there is sufficient evidence shall be tried in court. (2) If in a case where there is a shortage of evidence and the private prosecutor proposes not supplementing the evidence, the private prosecutor shall be persuaded to withdraw the case or it is judged rejected. Where the private prosecutor has been summoned twice in accordance with law but refuses to appear in court without a legitimate explanation or abandons the cases half-way without the court's permission is handled as a withdrawal of the case. Where in the course of courtroom trial, adjudicatory personnel have doubts about the evidence and need to investigate for verification, apply the provisions of 191 of this law. Article 206:People's courts may mediate private prosecution cases; before the judgment is announced, the private prosecutor may himself settle with the defendant or withdraw the case. Mediation is not applied in cases provided for in article 204 , clause 3 of this law. The trial period for private prosecutions in the people's courts where the defendant is detained applies article 202, clauses 1 and 2 of this law, where the defendant is not incarcerated, the verdict shall be announced within 6 months of accepting the case. Article 207:The defendant in a private prosecutions may raise a counter-claim against the private prosecutor during the course of a private prosecution. Counter-claims apply the provisions for private prosecutions. (2) the defendant admits his crimes and has no objections to the alleged criminal facts. (3) The defendant has no objection to applying the summary procedures. When the people's procuratorate raises a prosecution, it may suggest that the people's court apply the summary procedures. (4) Other cases where use of summary procedures is inappropriate. Article 210:In cases applying the summary procedures at trial where the punishment might be three years or less imprisonment, a collegial panel may be formed or a single adjudicator may try the case alone; for those where the punishment might exceed three years imprisonment, a collegial panel should be formed for trial. In public prosecutions applying the summary procedures at trial, the people's procuratorate shall send someone to appear in court. Article 211:In cases applying the summary procedures at trial, adjudicators should ask the defendants for their comments on the charges, inform the defendants of the legal provisions on applying the summary procedures, and confirm whether the defendants consent to applying the summary procedures. Article 212:In cases applying the summary procedures and with the adjudicators permission, the defendants and their defenders may debate public and private prosecutors as well as their agents ad litem. Article 213:Cases applying the summary procedures at trial do not follow section 1 of this chapter's time restrictions on delivery, interrogating defendants, questioning witnesses and expert evaluators, presenting evidence and courtroom debate procedures. However, before the announcement of the verdict, the defendants final statement and comments should be heard. Article 214:In cases applying the summary procedures at trial, people's courts shall complete trial within 20 days of accepting the case; in cases where there might be a sentence of more than 3 years imprisonment, this may be extended to a month and a half. Article 215:Where peoples courts discover in the course of trial that it is unsuitable for applying the summary procedures, they shall newly try the case in accordance with the provisions of section 1 or section 2 of this chapter. Article 216:Defendants, private prosecutors and their legally-designated representatives have the right to appeal to the court above, either in writing or orally, if not accepting a judgment or ruling from a local court of any level. The defendant's defender and close relatives may raise an appeal with the defendant's consent. The parties to attached civil lawsuits and their legally-designated representatives may raise an appeal to the portion of first instance verdicts and judgments related to the attached civil litigation. The defendants right to an appeal must not be withheld for any reason at all. Article 217:When local people's procuratorates of any level find that the ruling or judgment of a people's court at their level is truly in error, they shall raise a prosecutorial counter-appeal to the people's court at the level above. Article 218:Where a victim or his legally-designated representative is unpersuaded by the first-instance court's judgment, they have the right to request, within five days of receiving the judgment, that the people's procuratorate raise a prosecutorial counter-appeal. Within 5 days of receiving a victim or their legally-designated representatives request, the people's procuratorate shall reply to the requesting persons as to whether or not it will raise a prosecutorial counter-appeal. Article 219:The period for appeals or prosecutorial counter-appeals from judgments is 10 days, the period for appeals or prosecutorial counter-appeals from rulings is 5 days, with calculations beginning from the second day after the judgment or ruling is received. Article 220:Where defendants, private prosecutors, and plaintiffs or defendants to attached civil lawsuits submit an appeal through the original people's court, the original people's court shall send the appeals complaint, together with the case file and evidence, to the people's court at the level above within 3 days, and at the same time send copies of the appeals complaint to the people's procuratorate at the same level and the opposing party. Article 221:Prosecutorial counter-appeals by local people's procuratorates of all levels against judgments or rulings of people's courts at the same level shall submit the appeals complaint through the original people's court, and also send a copy to the people's procuratorate at the level above. The original people's court shall send the appeals complaint, together with the case file and evidence, to the people's court at the level above, and send a copy of the appeals complaint to the parties. It the people's procuratorate at the level above finds that the prosecutorial counter-appeal is improper, it may withdraw the counter-appeal at the people's court of the same level, and notify the people's procuratorate at the level below. Article 222:The second-instance people's court shall carry out a comprehensive review of the facts found by the first-instance people's court and the law it applied, unrestricted by the scope of the appeal or prosecutorial counter-appeal. Where in a joint crime only some of the defendants appeal, the entire case should be reviewed and handled together. (1) Cases where the defendant, private prosecutor or their legally-designated representatives raise objections to the verified facts or evidence from the first-instance trial, that might influence judgment or sentencing. (4) Other cases that should be tried in a court session. Where second-instance people's courts decide not to hold in-court trial proceedings, they shall interrogate the defendant and hear the comments of other parties, defenders or agents ad litem. In appeals or counter-appeal cases where a second-instance people's court holds in-court proceedings, it may do so at the place where the crime occurred or at the location of the original people's court. Article 224:In cases where people's procuratorates raise an prosecutorial counter-appeal or in second-instance public prosecution cases where the court is holding in-court proceedings, the people's procuratorate at the same level shall appoint personnel to appear in court. After the second-instance people's court decides to hold in-court proceedings, it shall promptly notify the people's procuratorate to read the case file. The people's procuratorate shall complete its reading within one month. The time for the people's procuratorate to read the case file is not calculated in the time limits for trial. (3) Where the facts in the original judgment are unclear or the evidence insufficient, the judgment may be changed after clarifying the facts; it may also be ruled to revoke the original judgment and remand to the original people's court for new trial. Where, after the original people's court has made a judgment following a remand for new trial as provided by item (3) above, a defendant raises an appeal or a people's procuratorate raises a prosecutorial appeal, the second-instance court shall make a judgment or ruling in accordance with law and must not again remand for new trial at the original people's court. Article 226:Second-instance people's courts hearing appeals by the defendant or his legally-designated representative, defender or close relatives, must not increase the defendant's penalty. In cases where the second-instance people's court remands to the original people's court for new trial, unless there are new criminal facts and the people's procuratorate has supplemented the indictment, the original people's court also must not increase the defendant's penalty. Where the peoples procuratorate raises a prosecutorial counter appeal or a private prosecutor appeals, the restrictions of the previous clause do not apply. Article 227:Second-instance people's courts discovering any of the following violations of legal procedures by the first-instance people's court at trial shall rule to revoke the original judgment and remand for new trial at the original people's court. (5) Other violations of statutory litigation procedures that might influence trial fairness. Article 228:In cases where the original court is holding a new trial on remand, it shall separately assemble a collegial panel and follow the first-instance procedures in tying the case. Judgments after new trial may be appealed or subject to prosecutorial appeal following the provisions of articles 216, 217 and 218 of this law. Article 229:Second-instance courts, upon review of an appeal or prosecutorial appeal form a first-instance ruling, shall follow articles 225, 227 and 228 of this law to respectively rule to reject the appeal or prosecutorial appeal, or to revoke or modify the original ruling. Article 230:In cases where the second-instance people's courts remands to the original people's court for retrial, the trial period will restart on the date on which the original people's court receives the remand. Article 231:Except as provided by this chapter, the procedures for second-instance people's courts hearing appeals cases or prosecutorial appeals are conducted following the first-instance trial procedures. Article 232:Second-instance people's courts accepting appeals or prosecutorial appeals shall complete trial within two months. This may be extended for two months in cases where a death sentence might be given or where there are attached civil lawsuits, as well as in any of the situations provided for in article 156 of this law, upon approval or decision of a high people's court of a province, autonomous region or directly governed municipality; where special situations require extension, report to the high people's court for approval. The period for the Supreme People's Court's handling of appeals and prosecutorial appeals that it accepts is determined by the Supreme People's Court. Article 233:Second-instance judgments and rulings, and judgments or rulings of the Supreme People's Court are final. Article 234:Public security organs, people's procuratorates's and people's courts shall properly safekeep suspects or defendants' property and its fruits which have been sealed, seized or frozen, checking it and making an inventory and transferring it along with the case. No unit or individual shall be allowed to misappropriate it or personally dispose of it. Lawful property of the victim shall be promptly returned. Prohibited items or items not suitable for long-term storage shall be handled in accordance with relevant national provisions. Objects that will be used as evidence shall be transferred along with the case, where items are not suitable for transfer, transfer an inventory, photo or other certificates of proof. Judgments made by the people's courts shall address sealed, seized and frozen assets and their fruits. After people's courts's judgments take effect, the relevant organs shall immediately dispose of the sealed, seized or frozen assets and their fruits in accordance with the judgment. Except for those lawfully returned to the victims, criminal proceeds and their fruits which have been sealed, seized or frozen, shall all be transferred to the national treasury. Article 235:The death penalty is reviewed and approved by the Supreme People's Court. Article 236: After review, the high courts shall report a case where an intermediate court has issued a sentence of death in the first-instance trial and the defendant has not appealed, to the Supreme People's Court for review and approval. The Supreme People's Court may hear or remand a case for new trial if it does not agree with the death sentence. First-instance cases in which the high court has issued a sentence of death and the defendant has not appealed or second-instance cases where a death sentence was given shall all be reported to the Supreme People's Court for review and approval. Article 237:Death sentences with a two year suspension given by the intermediate courts are to be reviewed and approved by the high courts. Article 238:In cases where the Supreme People's Court reviews a death sentence or high courts review a suspended death sentence, a collegial panel comprised of three adjudicators shall perform the review. Article 239:In cases where the Supreme People's Court reviews a death sentence, it shall issue a ruling authorizing or not authorizing the death penalty. The Supreme People's Court may return a case for retrial de novo or modify the judgment in cases where it does not authorize the death penalty. Article 240:The Supreme People's Court shall interrogate the defendant in cases where it is reviewing a death sentence, and hear the defense lawyer's opinions where the defense lawyer has so requested. The Supreme People's Procuratorate may submit opinions to the Supreme People's Court during the course of reviewing the death sentence. The Supreme People's Court shall give notice to the Supreme People's Procuratorate of the results of its death penalty review. Article 241:Parties or their legally-designated representatives and close representatives may raise an appeal to a people's court against a judgment or ruling that has already taken effect, but cannot stop the enforcement of the judgment or ruling. (5) Where, at the time that adjudicators tried the case, there was corrupt, prejudicial or arbitrary conduct. Article 243:If the president of any level of people's court finds that there was an error of face or application of law in any effective judgement from that court, he must submit it to the adjudication committee for handling. If the Supreme People's Court finds that an effective judgment of any level of court is truly in error, or a court finds that a court below's effective judgment was truly in error, they have the right to review it or order the lower people's court to have a retrial. If the Supreme People's Procuratorate finds that an effective judgment of any level of ppeople's court is truly in error, or a procuratorate finds that a court at a level below's effective judgment was truly in error, they have the right raise an appeal in the people's court at their same level in accordance with trial supervision procedures. In cases of prosecurotrial appeals from the people's procuratorates, the people's court that accepts the appeal shall form a collegial panel to retry the case, and where the original trial's facts were unclear or evidence insufficient, may order a lower people's court to retry it. Article 244:Where a higher people's court orders a people's court below to hold a retrial, it shall order a lower court other than the original people's court to hear the case; where it would be more appropriate for the original people's court to retry it, they may also order the original people's court to do so. Article 245:In cases where the people's courts follow the judgment oversight procedures to hold a new trial, where the original people's court is holding trial, it shall form a separate collegial panel. If it was originally a first-instance case, trial shall be conducted according to first-instance procedures, and all judgments or rulings made may be appealled or subject to prosecutorial appeals; if it was originally a second-instance case, or a case heard by a people's court above, trial shall be conducted according to second-instance procedures and all judgments or rulings made are final judgments or rulings. In retrials where the people's court will hold in-court proceedings, the people's procuratorate at the same level shall appoint personal to appear in court. Article 246:In cases being retried by the people's courts where it is necessary to adopt compulsory measures against the defendant, the decision is made by the people's court in accordance with law; in retrial cases where the people's procuratorate has submitted a prosecutorial appeal where it is necessary to adopt compulsory measures against the defendant, the decision is made by the people's procuratorate. In cases where the people's courts follow trial supervision procedures, it may be decided to suspend enforcement of the original judgment or ruling. Article 247:In cases where the people's courts follow trial supervision procedures to hold a new trial, trial shall be completed within three months of the arraignment or new trial decision, where necessary the time limit may be extended, but must not exceed six months. The provisions of the preceding paragraph shall apply to the time limit for the trial of a prosecutorial appeals case that is accepted by a People's Court and is to be tried by it in accordance with the trial supervision procedures. Where it is necessary to direct a people's court at a lower level to retry the case, that decision shall be made within one month of receiving the prosecutorial appeal and the lower people's court shall apply the preceding for trial time limits. Article 248:Judgments and orders shall be carried out after becoming legally effective. (3) Death sentence judgments review and authorized by the Supreme People's Court and suspended death sentence judgments reviewed and authorized by the high courts. Article 249:Where the first-instance people's courts rules that the defendant is not-guilty or may be excused from criminal penalties, if the defendant is being detained, he shall be released immediately following the pronouncement. Article 250:Judgments by the Supreme People's Court giving or review and approving a death sentence for immediate execution shall have the President of the Supreme People's Court sign an execution order. If convicts sentenced to death with a two year suspended sentence do not commit another intentional crime within the two year suspension and the period for the suspended death sentence is complete, the sentence shall be commuted, and the enforcement organ will submit a written opinion reporting to the High People's Court for a ruling. If they committed an intentional crime and it is verified and reviewed, they shall be executed and the high people's court will report to the Supreme People's Court for review and approval. （3）The convict is currently pregnant. After the reason for stopping enforcement in items (1) and (2) has disappeared, a report must be made to the Supreme People's Court requesting the president sign an execution order before it enforcement; where enforcement is stopped due to item (3), it shall be reported to the Supreme People's Court for a change of judgment. Article 252:Before a people's court transfers a prison for execution, it shall notify the people's procuratorate at the same level to appoint someone for on-scene supervision. Death sentences are carried out by methods such as shooting or lethal injection. Death sentences may be carried out an execution grounds or inside a designated detention area. Adjudicatory personnel directing the enforcement shall verify the identify of the convict, ask it they have any final words, and then hand them over for enforcement of the death penalty. If before the execution it is discovered that there may be an error, enforcement shall be temporarily stopped and the circumstances reported to the Supreme People's Court for a ruling. Executions shall be publicly announced, but publicly displayed. After an execution, a record shall be made by the clerks at the scene. The people's court receiving a prisoner for implementation of the death penalty shall report the conditions of the execution to the Supreme People's Court. After the death penalty has been carried out, the enforcing court shall notify the criminal's family. Article 253:When convicts are transferred for enforcement of their penalty, the people's court delivering them shall send the relevant legal documents to the public security organ, prison or other enforcement organ within 10 of the judgment taking effect. Convicts who have been sentenced to a death sentence with two year suspension, indeterminate imprisonment or fixed-term imprisonment, are brought to the prison for enforcement of their penalty by the public security organ. Where convicts sentenced to a fixed-term of imprisonment have less than three months remaining before they are transferred for enforcement of their penalty, the detention center will enforce it. For convicts sentenced to short-term detention, the public security will enforce it. Juvenile offenders shall be have their penalties enforced in a juvenile correctional facility. Enforcement organs shall promptly detain the convict and notify his family. Convict sentence to a fixed-term imprisonment or short-term detention whose period of enforcement is completed shall be given a written proof of release by the enforcement organ. Article 254:In any of the following circumstances, convicts sentenced to a fixed-term imprisonment or short-term detention, may temporarily serve their sentence outside of prison. (3) Those unable to care for themselves where application of temporary enforcement outside of prison would not endanger society. Those given indeterminate imprisonment who have the circumstance in item (2) above, may temporarily serve their sentence outside of prison. Convicts who might endanger society while given medical parole and prisoners who injure or mutilate themselves, must not be given medical parole. People's government hospitals at the provincial level or above diagnose and issue certifitcates of proof as to whether a convict really has a serious illness and needs medical parole. Prior to being delivered for enforcement, temporary enforcement outside of prison is determined by the people's court delivering [a convict] for enforcement; after delivery for enforcement, temporary enforcement outside of prison is determined by the prison or detention center submitting a written opinion for approval to a prison management organ at the provincial level or above or a level one or higher municipal public security organ in the community. Article 255:Prisons and detention centers submitting written opinions on temporary enforcement outside of prison shall sent a copy of the written opinion to the people's procuratorate. The people's procuratorate may submit written comments to the deciding or approving organ. Article 256:An organ deciding on or approving temporary enforcement outside of prison shall send a copy of the decision to the people's procuratorate. Where the people's procuratorate feels that temporary enforcement outside of prison is improper, it shall submit written comments to the organ that decided on or approved it within one month of receiving notification. After the organ that made the decision or approval receives the people's procuratorate's written comments, it shall immediately confuct a new review of that decision. （3）after the reason for temporary service outside of prison has disappeared or the penalty period is over and completed. Where a people's procuratorate decides that a convict temporarily serving a sentence outside of prison shall be taken into prison, the people's court make a decision and sends the relevant legal documents to the public security organ , prison or other enforcement organ. Where convicts who are not eligible for temporary enforcement of their sentence outside of prison, but through bribery or other illegal means are serving their sentence outside of prison, the period served outside of prison is not counted against the term of their sentence. Where convicts escape or flee during the period of temporary serving their sentence outside of prison, the period where they are at large is not counted against the term of their sentence. Where a convict dies during a period or temporary enforcement outside of prison, the enforcement organ shall promptly notify the prison or detention center. Article 258:The community corrections organizations are responsible for implementation of community corrections carried out in accordance with law for convicts sentenced to controlled release, declared under a suspended sentence, paroled or temporary serving their sentence outside of prison. Article 259:The public security organs will enforce deprivation of political rights against convicts sentenced to it. When the period for enforcement is complete, the enforcement organ shall notify the person in writing and also his work-unity, and base-level residential organization. Article 260:Where convicts given a fine have not paid it over at the completion of the time period, the people's court shall compel payment; if there is truly difficulty in making payment due to a disaster or other force majeure, a ruling may be made for a reduction or waiver. Article 261:Decisions to confiscate property, regardless of whether applied as a supplement or alone, are all enforced by the people's courts; when necessary, they may be enforced together with the public security organs. Article 262:Where a convict commits another crime while serving his sentence, or where criminal conduct that was undiscovered at the judgment is discovered, the enforcement organ will transfer it to the people's procuratorate for handling. When convicts sentenced to controlled release, short-term detention, a fixed prison term or indeterminate imprisonment truly repent and reform or perform a meritorious service during the period of enforcement, shall be given commutation or parole, the enforcement organ submits a written recommendation and sends a copy of the written recommendation to the people's procuratorate. People's procuratorates may submit written comments to the people's court. Article 263:People's procuratorates finding that a people's court commutation or parole decision is in error shall submit a written corrective opinion to the people's court within 20 days of receiving a copy of the written ruling. People's courts shall newly form a collegial panel to conduct trial within one month of receiving a corrective opinion, and make a final ruling. Article 264:If during the course of enforcing a criminal penalty, prisons or other enforcement organs feel that a judgment was in error, or the convict raises an appeal, it shall be transferred to the people's procuratorate or people's court of original judgment for handling. Article 265:People's procuratorates supervise whether the enforcement of criminal penalties by enforcement organs is lawful. In unlawful circumstances are discovered, the enforcement organ shall be notified to make corrections. Article 266:Implement the directive of education, reform and rescue for juveniles committing crimes, and adhere to the principal of education first with punishment as a supplement. People's courts, people's procuratorates and public security organs handling juvenile criminal cases shall ensure the juvenile's exercise of his rights and ensure that the juvenile receives legal assistance, as well as having trial, procuratorate, and investigation personnel familiar with the special traits of juveniles undertake the case. Article 267:Where juvenile criminal suspects and defendants that have not retained a defender, the people courts, people's procuratorates and public security organ shall notify the legal aid organization to appoint a lawyer to provide a defense. Article 268:Public security organs, people's procuratorates and people's courts handling juvenile criminal cases, may investigate the circumstances of the juvenile suspect or defendant's upbringing, the reasons for the offense, the suspect's supervision and educational conditions, and other relevant circumstances. Article 269:Application of arrest measures to juvenile suspects and defendants shall be strictly limited. People's procuratorates reviewing for approval of arrest, and people's courts deciding to arrest shall interrogate juvenile suspects or defendants and hear the defense attorney's opinions. Juveniles shall be detained separately from adults when held in custody, arrested, or serving criminal penalties, separately manged and separately educated. Article 270:The juvenile suspect's legally-designated representative shall be notified to appear when interrogating or trying juvenile criminal cases. Where the is not way to notify them, the legally-designated representative cannot appear or is a co-criminal, the juvenile suspect or defendant's other adult family members or representative from their school, workplace, basic level organization from their place of residence or child welfare organization may also be notified to appear in court, and such circumstances shall be recorded in the case file. 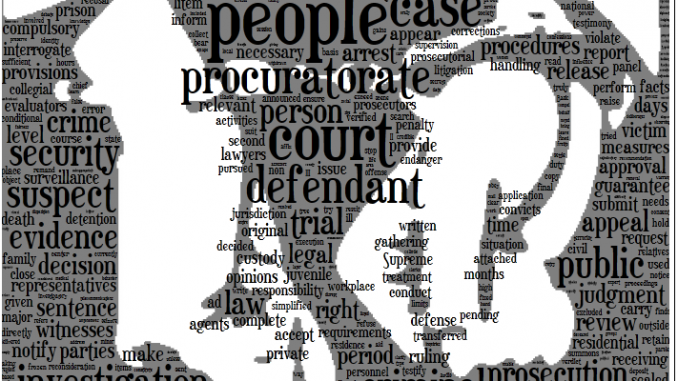 Legally-prescribed agents making appearances may exercise the juvenile suspect or defendant's rights on his behalf. Where legally-designated representatives or others making an appearance find that the persons handling the case have violated the juvenile's lawful rights and interests at interrogation or trial, they may submit an opinion. The interrogation records and court records shall be given to the legally-designated representative or other persons appearing to read or have read to them. When female juvenile suspects are interrogated there shall be female personnel present. When trying juvenile criminal cases, after the juvenile defendant's final statement his legally-designated representative may make a supplementary statement. The provisions of paragraph 1, 2, and 3 apply to the questioning of juvenile victims. Article 271:Where juveniles suspected of crimes found in Chapters 4, 5 and 6 of the criminal law who might receive penalties of 1 year imprisonment or less and meet the requirements for prosecution, but demonstrably regret their crime; the people's procuratorate may issue a conditional non-prosecution decision. Before making a conditional non-prosecution decision, people's procuratorates shall hear the public security organ's and victim's opinions. The provisions of article 175 and 176 of this law apply where the public security organ requests a reconsideration or review of a conditional non-prosecution decision, or the victims appeal. Where juvenile criminal suspects and their legally-designated representatives object to a conditional non-prosecution decision by the people's procuratorate, the people's procuratorate shall issue a decision to prosecute. Article 272:During the probationary period for conditional non-prosecution, the people procuratorate will perform supervisory inspections of the juvenile suspect under conditional non-prosecution. The juvenile criminal suspect's guardian shall strengthen supervision and education of the juvenile suspect, and cooperate with the people's procuratorate in completing supervision and inspection work. The probationary period for conditional non-prosecution is not less than 6 months and not more than 1 year, to be calculated from the day that the people's procuratorate make the conditional non-prosecution decision. （4）Accept corrections and education as required by the observation organ. （2）Violate public security management rules or supervisory management rules of the organ enforcing the conditional non-prosecution probation, where the circumstances are serious. Where juvenile criminal suspects given conditional non-prosecution do not have any of the circumstances described above during the probationary period, the people's procuratorate shall issue a non-prosecution decision when the probationary period is complete. Article 274:In cases where the defendant is not yet 18 years-old at the time of trial, do not hold an open trial. However, with the consent of a juvenile defendant and his legally-designated representative, the juvenile's school and child welfare organizations may appoint representatives to appear. Article 275:The relevant criminal records shall be sealed for those who were not yet 18 years-old at the time of the offense and were sentenced to 5 years or less imprisonment. Where criminal records are sealed, they must not be provided to any workplace or individual, except where necessary for judicial organs case-handling or relevant workplace inquiries made on the basis of national regulations. Workplaces making inquiries in accordance with law shall preserve the secrecy of the sealed criminal records. Article 276:Except where this chapter has provided otherwise, follow this law's other provisions in handling juvenile criminal cases. (1) Cases arising from a civil dispute that involve offenses in the fourth and fifth chapters of the specific provisions of the Criminal Law, that might be punished by up to three years imprisonment. (2) Cases of crimes of negligence, except for crimes of dereliction of duty, that might be punished by up to seven years imprisonment. The procedures provided in this chapter do not apply where the suspect or defendant has intentionally committed a crime within the last five years. Article 278:Where the parties of both sides have settled, public security organs, people's procuratorates and people's courts shall hear the opinions of the parties and other relevant persons to review the voluntariness and lawfulness of the settlement and moderate the drafting of a settlement agreement. Article 279:Public security organs may make a recommendation for lenient handling in cases that have reached a settlement. People's procuratorates may submit a recommendation for lenient handling to the people's courts; where the offense is slight and it is not necessary to impose a criminal penalty, they may make a decision to not prosecute. People's courts may give a lenient punishment in accordance with law. Article 280:In major crimes such as crimes of corruption and bribery or terrorist activities, where the suspect or defendant is in hiding and cannot be brought into the case after one year, or where the suspect of defendant has died, and unlawful gains or other property involved in the case should be disgorged, the people's procuratorate may submit a written application for confiscation of illegal gains to the people's court. Where the public security organs find that there is a situation as provided for in the preceding clause, it shall write out an opinion on confiscation of unlawful gains and send it to the people's procuratorate. An application for confiscation of unlawful gains shall provide evidentiary materials relevant to the criminal facts and unlawful gains, and also clearly list the types of assets, their numbers, their location and and circumstances of sealing, seizing or freezing [the assets]. When necessary, people's courts may seal, seize or freeze property subject to an application for confiscation. Article 281:The intermediate people's court at the site of the crime or the residence of the criminal suspect or defendant will form a collegial panel to hear applications for confiscation of unlawful gains. The people's courts shall issue a public notice after accepting an application for confiscation of unlawful gains. The public notice period is 6 months. Close relatives of criminal suspects and defendants or other interested parties have the right to apply to participate in the litigation, and may retain an agent ad litem to participate in the litigation. After the public notice period is complete, the people's courts conduct a hearing on the confiscation of unlawful gains. Where interested parties are participating, the people's court should hold an in-court hearing. Article 282:Property verified through trial as being unlawful gains and other property involved in the case shall be ruled confiscated, except for that returned to the victims in accordance with law; For assets that should not be disgorged, the application shall be rejected and any sealing, seizure or freezing measures removed. The suspect or defendant and his close relatives or other interested parties or the people's procuratorate may raise an appeal against ruling by a people's court made following the provisions of the preceding paragraph. Article 283:Where during the course of hearings a fleeing suspect or defendant surrenders on his own accord or is captured, the people's court shall terminate the hearing. Where confiscation of a suspect or defendant's property was truly in error, it shall be returned and compensation made. Article 284:Mentally ill persons evaluated through statutory procedures as not bearing criminal responsibility under law who exhibit violent behavior, endanger public safety or endanger citizens' personal safety, and might continue to endanger society, may be given compulsory treatment. Article 285:The compulsory treatment of mentally ill persons on the basis or this provision shall be on decision of a people's court. Public security organs discovering a mentally ill person who meets the requirements for compulsory treatment shall write out a compulsory treatment opinion and transfer it to the people's procuratorate. The people's procuratorate shall apply to the people's courts for compulsory treatment of mentally ill persons meeting the requirements for compulsory treatment transferred by the public security organs or that they discover while performing a review for prosecution. People's courts discovering in the course of trial that a mentally ill persons meets the requirements for compulsory treatment may make a compulsory treatment decision. Prior to the people's courts making a compulsory treatment decision, the public security organs may adopt temporary protective measures for mentally ill persons exhibiting violent behavior. Article 286:After people's courts accept an application for compulsory treatment, they shall assemble a collegial panel to conduct a hearing. People's courts trying compulsory treatment cases shall notify the subject of the application's, or defendant's, legally-designated representative to appear. Where the subject of the application or defendant has not retained an agent ad litem, the people's courts shall notify a legal aid organization to appoint a lawyer to provide him legal assistance. Article 287:Upon the courts' hearing, where the subject of the application or defendant meets the requirements for compulsory treatment, a decision for compulsory treatment shall be issued within one month. If persons placed under compulsory treatment, victims and their legally-designated representatives or close family members do not accept the compulsory treatment decision, they may apply for review to the people's court at the level above. Article 288:Compulsory treatment institutions shall periodically carryout diagnostic evaluation of the person undergoing compulsory treatment. For those who are already not physically dangerous and don't need to continue compulsory treatment, a release opinion shall be be submitted for approval to the people's court that made the compulsory treatment decision. The person undergoing compulsory treatment and his close family members have the right to apply for release from compulsory treatment. Article 289: The people's procuratorates supervise compulsory treatment decisions and enforcement. Article 290:Army defense departments have the power to conduct investigations of criminal cases occurring within the army. Prisons conduct investigations of crimes committed by convicts within the prisons. Relevant provisions of this law apply when military defense departments and prisons handle criminal cases. The estimated value for a full translation of this post is $2,315.76 USD at the below-market rate of $.06 per character, with 37,946 characters.